Donostia-San Sebastián. Today, January 21, is 'the day after,' and a holiday in Donostia. Yesterday the sounds of drumming was heard during this party that “only” last 24 hours, however intensely, that is also celebrated in a good number of Basque clubs and by Basques, Donostiarras, and not, in the Diaspora. In fact, part of the Diaspora celebrated last weekend, but there are still places, for various reasons, will celebrate San Sebastian and the Tamborrada later, mainly in the coming week. 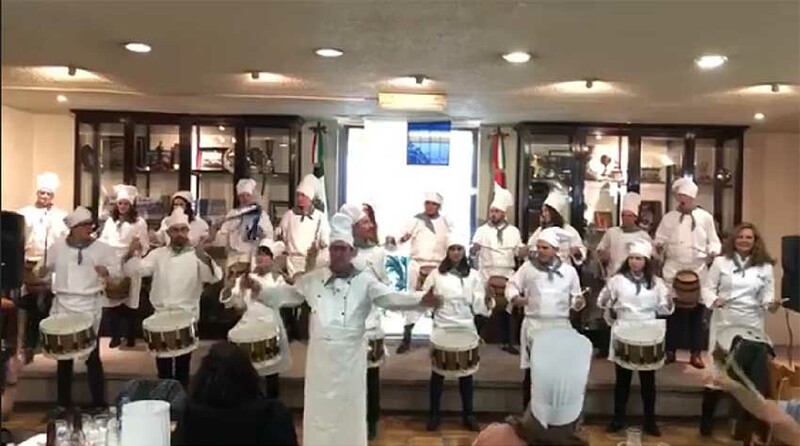 Among those who celebrated the Tamborrada last weekend were the Euskal Etxea in Mexico City with a festivity in sync with that in Donostia, with a real Tamborrada with its corresponding drum major, rehearsals, drums, barrels…just like in Donostia. They were also joined by their friends at the Euskal Etxea in Madrid who held a dinner and drumming at the Zerain Restaurant, or the traditional Tamborrada at Jai-Alai. The Euskal Etxea in Paris alson joined in with the Anaiki Choir and a fanfare included, under the coordination of Jean-Marie Guezala, linked to Lezo-Donostia; or the drummers, and barrels at the Euskal Etxea in Shanghai. We can’t forget the Tamborrada at the Euzko Etxea in Necochea, Argentina that will celebrate next week. Or the celebrations at Gure Txoko in Valladolid or Barcelona, or those at Laurak Bat in Valencia, and others in Caracas or moving north in the American continent at the Cooks and Soldiers Restaurant in the city of Atlanta, Georgia. Among those celebrating next week are also the Eusko Etxea in New York that will celebrate at its clubhouse on Saturday the 26th beginning at 19:30 (if you would like to join them contact Itziar Albisu: mitzalg@gmail.com). Or the children’s Tamborrada at the Euskal Etxea in Madrid; the adult Tamborrada took place on the 19th, but the children will have their turn on the 27th at 13:15 outside the Zarzuela Theater in front of the clubhouse. Go see them! You’ll enjoy it!